MolCart is a chemical cartridge which allows you to store large chemical compound libraries for searching and analysis. It uses a fast relational database which is freely available without any limitations. Molcart is also unrestricted in terms of number of users. All you need is to install the MySQL server (www.mysql.com) on your Linux, Windows, or Mac box. MolCart is an enterprise wide chemical management system. 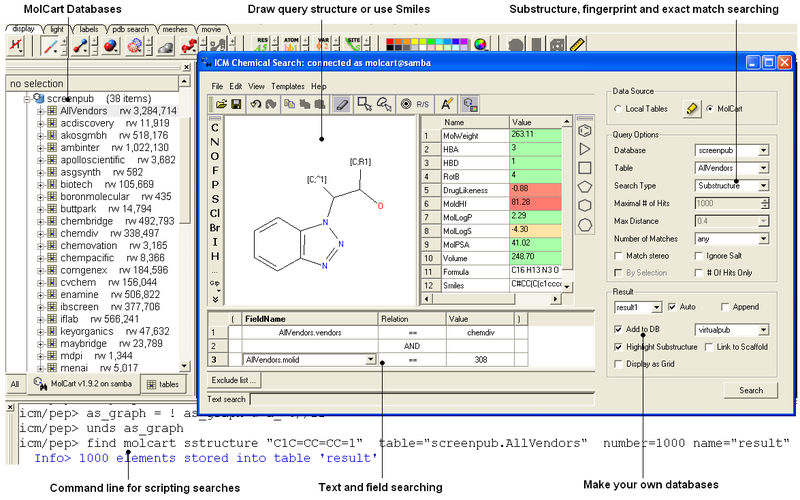 Compound databases of any size can be stored in MolCart and analyzed and searched using ICM cheminformatic tools. Flexible database administration tools include: managing databases, tables, users and privileges. 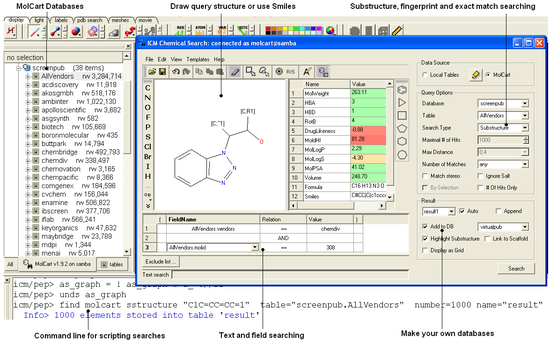 Fast chemical substructure and similarity search. Search using Smiles and Smarts patterns, fingerprint similarity, similarity/substructure comb and exact match. Fulltext (keywords) search by set of text fields or numerical data. Add any number of chemical property filters (e.g. by MolWeight, LogP, etc ...). Add new columns with molecular properties directly into the database. Make unique (non-redundant) datasets of several chemical tables. Develop target specific compound libraries. Click here to see MolCart in action. We also offer MolCart compounds which is an up-to-date collection of vendor chemical databases. MolCart Compounds can be easily integrated into the MolCart Chemical Cartridge. Fast SCSI drives are recommended for large data sets. To achieve the maximum performance we recommend using a dedicated machine to run MolCart. We recommend to use my-large.cnf or my-huge.cnf MySQL configuration files to run MolCart. You can find more information about MySQL server optimization here.